©IREM SOFTWARE ENGINEERING INC. All rights reserved. ©HEIWA / OLYMPIA / Character design by SHIROGUMI INC. Finally exceed 4 million people! All 17 models are free to play free of charge! Acknowledged in operation "Basilisk - Koka Ninja Hojo - Kizuna" "Another God Hades - Robbed ZEUSver.-" "Pachislot Girls & Panzer" etc! ▼ Hot excitement with real machine applications! All-you-can-enjoy unlimited game of real appliances that have filled the halls, from famous aircraft of the past year to the latest models! 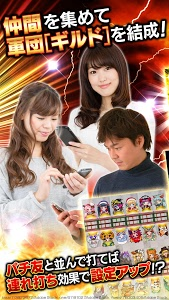 Defeat the pachinko / pachislot app with the unique quality of smartphone! Turn around virtual halls of various features, and you can increase pattles to where! What? ▼ Let's play with friends! Let's make friends! By being friends with other players, you can also hit pachinko alongside each other at the next seat and build communication elements such as creating friendly guilds and guilds (friendly guilds)! A scout may come from a powerful corps if you can play an active part in the event! What? First of all, feel free to "greet" get points! ! 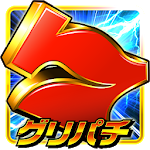 ▼ Challenge! Events and missions held at any time! 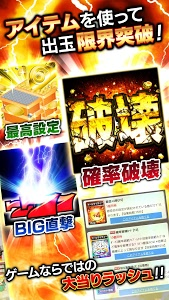 Pachinko ball out & Slot medal ranking · Fight against corps · Mission events and so on Various events unique to virtual halls are abundant! Participation is of course free! It is good to see wisdom! You can run through with luck! It gets hotter than the actual hole! What? There are plenty of benefits such as Master League, Avatar, Kisekae, Title, Director, etc., getting involved in events and specific models! Let's boast my page to everyone! If you get to the top of the ranking celebrity! What? Ultra-popular model "Yoshimune" which swept the hall of Unit 4 era finally appears in Grippachi! ! A large pachislot machine "Yoshimune" which is engraved deeply in the memory of fans as a popular model which appeared in 2003 and is representative of the era. The pachislot simulator application which faithfully reproduced this model is finally appearing in Grippachi. 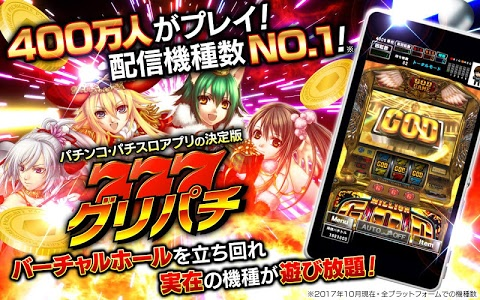 "Yoshimune" which continued to attract fans with various innovative elements such as gaming with 1 G bonus of BIG bonus 1 G consecutive, industry's first production with shutter liquid crystal, and three types of announcements directed at BIG bonus You can enjoy it even with the grip! The throne recapture! The pachislot machine "Million God - Triumph of the Gods" who gained popularity in the halls of the country participated in Grippachi! Enjoy the appeal of all the charms of "Million God - Triumph of the Gods", such as new director, games of incandescence and freeze of familiar! This time we will start a tank road in pachislot! "Garpan" which caused the unprecedented boom finally becomes a pachislot application! Big screen "Twin liquid crystal" and "Attack vision" liquid crystal production, as well as equipped with all the voice and BGM finally Gurupachi first appear! 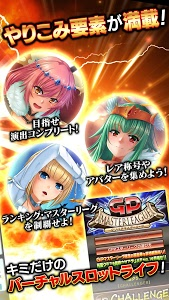 · To use Gripachi, you need to register and login to GREE (GREE). · Customers who are not registered on GREE (GREE) can register newly for free from this application. · This application is subject to Android OS 2.3 or higher. * Tablet terminals are out of guarantee of operation. * Malfunctions caused by terminals outside the operation guarantee are not subject to support. 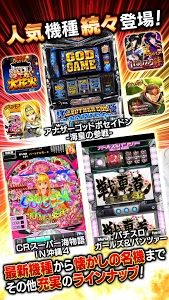 · In order to enjoy the actual machine application, it is necessary to separately download the "Pachinko application · Slot application". Download is free. © SANYO BUSSAN CO., LTD.
© IREM SOFTWARE ENGINEERING INC. All rights reserved. © HEIWA / OLYMPIA / Character design by SHIROGUMI INC.